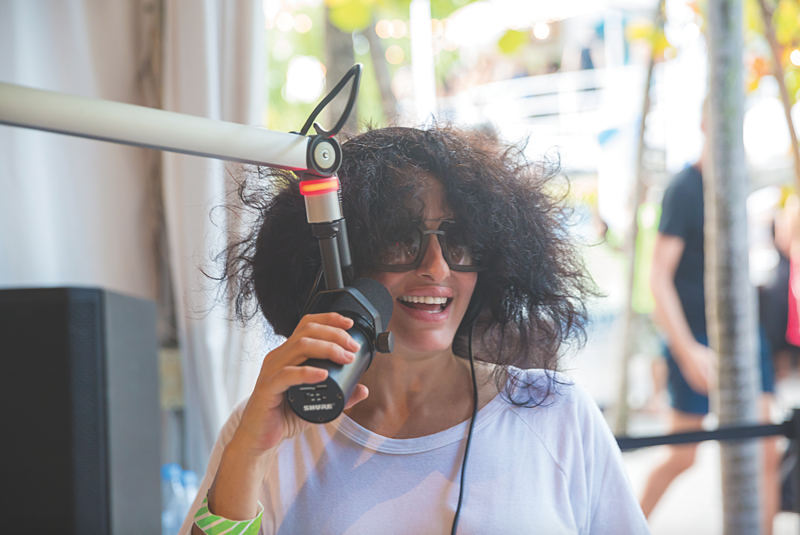 Nicole Moudaber loves to keep moving. Everything about the DJ, producer and label boss evokes constant motion, from her propulsive, percussive music to her trademark mane of raven hair, which shakes as she DJs as if blown by its own wind. Even when not behind the decks, in the studio, or plotting her next festival stage takeover, she’s behind the wheel of a sports car, substituting beats-per-minute for miles-per-hour. But even for the multitasking mother of Mood Records, 2018 was especially hectic. “I’ve got my first weekend off — can you imagine?” she says during a rare moment of repose in late October, speaking by phone from London, her main home these days. (She also recently “invested in a little place in Miami.”) Those non-stop working weekends included appearances at festivals such as Electric Forest, Lightning In A Bottle, Creamfields and Tomorrowland, as well as multiple incarnations of her back-to-basics MoodRAW warehouse party series, and club dates from San Francisco to Singapore. Not even a lack of oxygen can slow Moudaber down. Fresh from a recent tour of Central and South America, she speaks with particular excitement of her first gig in Quito, Ecuador, which at nearly two miles above sea level is the second highest capital city on Earth. “There’s hardly any oxygen there,” Moudaber says. “It felt like walking on the moon. I had an oxygen tank onstage, every now and then taking hits. You literally couldn’t breathe, basically. It’s insane. 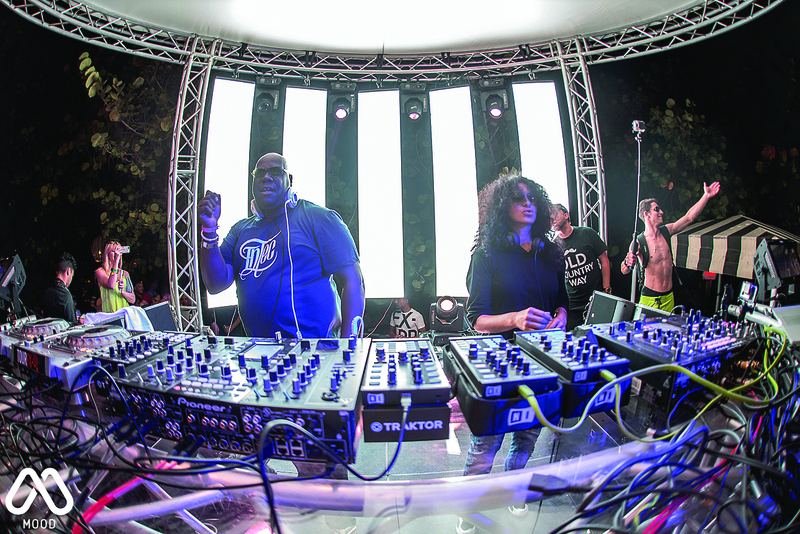 Since Carl Cox shouted her out as dance music’s most underrated DJ in 2009, Moudaber’s ascent into the upper echelons has, like all things in her life, moved at a breakneck clip. These days, no one is underrating her. 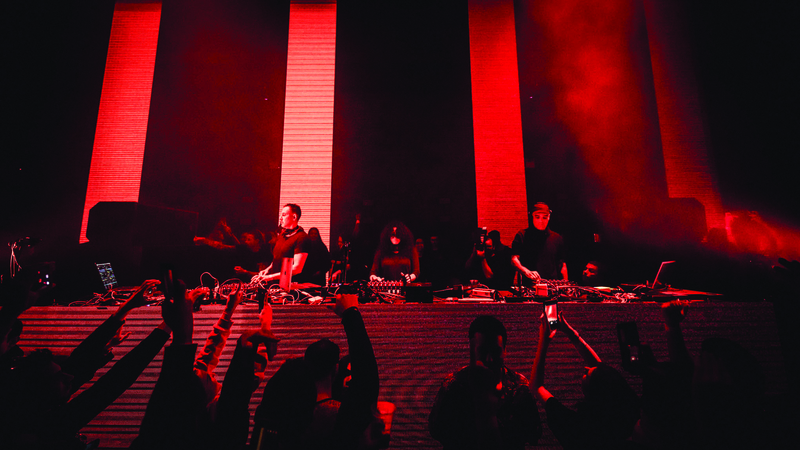 Her label, Mood Records, celebrated its 50th release last year, and her MoodZONE stage takeovers at the BPM Festival, EDC Las Vegas and elsewhere have the EDM masses flocking to her darkly pulsating techno, as well as to the like-minded DJs she books, including Patrick Topping, Danny Tenaglia and Lauren Lane. Her weekly ‘In the Mood’ syndicated radio show reaches 16 million listeners worldwide. At this point, she’s become an ambassador for her preferred genre, turning more young fans onto techno than perhaps any other artist of her generation — and she’s done it with an attitude as uncompromising as her pedal-to-the-floor music. Moudaber’s dedication to advancing the classic sounds of Detroit and Berlin has earned the respect of her peers. Earlier this year she received one of her greatest honors yet, when she was asked to close out Detroit’s venerable Movement festival with one of her MoodRAW events. The evening featured former Deep Dish DJ Ali ‘Dubfire’ Shirazinia, rising Japanese star Hito, and even a surprise appearance by hip-hop legends Wu-Tang Clan. But everyone in attendance knew the real star of the night was the “Queen of Techno,” laying down oceanic layers of percussion and bass, even as she fended off the advances of Wu-Tang’s U-God, who kept coming up behind her during her set to tell her that she smelled nice. The evening was captured in an episode of ‘In the Mood’, which is syndicated to 83 FM stations in 50 countries. “It can’t get better than this, people!” she declared proudly, introducing the episode. Moudaber’s rise has followed a circuitous path. Born in Nigeria to Lebanese parents, she discovered house and techno as a college student in the early ’90s, first on a visit to New York that included a stop at the legendary Tunnel Club, and later while finishing her studies in London, which she regularly interrupted with visits to places such as Strawberry Sundae, an underground hard house night, and Trade, an infamous gay afterhours. When she rejoined her family in Lebanon after graduation, she was surprised to discover that the country’s once cosmopolitan capital Beirut, still under Syrian occupation and rebuilding from decades of war, lacked a dance music scene. So she decided to start one. Her biggest party, Trashy Renaissance, is still the stuff of Lebanese clubbing legend. It took place between a church and a bombed-out mosque, with over 1,000 newly converted techno fans — Muslims, Christians, Jews — dancing under the wary eye of Syrian military police. Almost single-handedly, Moudaber brought dance music to her home country. But she soon grew frustrated with the oppressive regime and moved back to London, where she continued promoting parties in a more permissive environment. She also caught the DJ bug — and true to form, she went all-in, teaching herself production and releasing her first singles, including ‘The Slap’ (a minimal techno banger that does, indeed, slap), in 2007. She hasn’t slowed down since. In 2013, Moudaber launched Mood Records with her own ‘In The Mood’: a slinky floor-filler with a sassy vocal hook — “I’m in the mood; you know you want it” — that nodded to her late nights at Trade. She also released her debut album, ‘Believe’, on Adam Beyer’s prestigious Drumcode label, cementing her status as a rising star with a set that added new colors to her palette, from the slow tech-house grooves of ‘Big Love With No Apology’ to the pattering, melodic synths of the beguiling ‘Lumiére Tamisée’. Moudaber had arrived. But she wasn’t about to stand still. In 2015, she surprised her fans again with ‘Breed’, a five-song collaborative EP with Skin, the charismatic lead singer of London alternative rock band Skunk Anansie. It was an improbable pairing, but it worked — Skin’s vocals oozed the sort of attitude Moudaber’s instrumental tracks had always implied in their punchy arrangements and tough-girl titles (‘The Whippin’ I’m Dishin’’, ‘See You Next Tuesday’, ‘She Wears The Pants’). Over the next year, the pair played multiple festival dates together, further expanding Moudaber’s fan base and proving she was the kind of artist who could take risks and reach new audiences. Moudaber especially embraces this more versatile approach on her ‘In the Mood’ radio show, which has made her distinctively raspy voice as familiar to techno fans as Zane Lowe’s is to Apple Music subscribers. “Some days it could be chill-out, another day it could be from a festival with banging techno, and anything in between,” she says. “It allows me to really play the stuff that I don’t normally play but I love. Easier to imagine is the Queen of Techno applying her whirlwind energy to other pursuits — not just her beloved auto racing, which she hopes to resume with a vengeance next year (once she’s gotten her hands on a new Mercedes SLS, “The GT3! Look it up, it’s mega”), but to her growing charity efforts as well. She’s a longtime supporter of the Lower Eastside Girls Club, an education center for at-risk girls and young women in New York City, helping with their music programs. She also donates to Solving Kids Cancer, a British NGO that recently played a key role in the development of a potential new treatment for neuroblastoma, a rare, deadly childhood cancer. She is most passionate, however, about her latest charity effort: the launch of Eleven, her own campaign to end the practice of female genital mutilation (FGM), a brutal tradition in many cultures in which a young girl’s genitalia are ritually cut, removed or partially sewn shut, ostensibly for religious reasons but mainly to curtail and control female sexuality. Moudaber chose her campaign’s name based on a shocking statistic laid out on Eleven’s GoFundMe page: “Every minute, somewhere in the world, 11 girls undergo female genital mutilation.” That adds up to nearly 6 million girls each year. An estimated 200 million women worldwide are living with the effects of FGM today, which include everything from infections and pregnancy complications to depression and PTSD, to the inability to experience sexual pleasure. The practice is most common in Africa and parts of Asia and the Middle East — but through various cultural diasporas, some form of FGM is performed in nearly every corner of the globe, including the U.S. and Moudaber’s adopted home country of England. All of the money raised by Moudaber’s Eleven charity will go to Magool, a women’s rights organization founded by Somali-British psychotherapist, activist and Guardian columnist Leyla Hussein, with whom Moudaber connected on social media while researching FGM. “She helps all the girls that undergo this practice,” Moudaber says. “Because you know, it damages you forever. You need lots of care, and we are here to help them do that. She’s got schools in seven African countries, I think. One I’m aiming to help her with is in Nigeria. Normally a conversation with Moudaber is in constant motion. Her words, though never lacking in warmth, are succinct and well chosen, and when she feels we’ve exhausted a particular topic — which usually happens quickly — she politely changes the subject or simply falls silent, waiting for another question. She has little patience for train-spotter discussions of the latest micro genres or the current state of EDM. And when it comes to the dreaded “women in dance music” discussion, her patience is understandably at an end; before our interview, her publicist specifically requests “no gender issues” be part of the conversation, a reasonable enough request from an artist who, even at the top of her game, was still being relegated to articles with headlines such as ‘Women Edging Their Way Into The DJ Booth’ (an actual New York Times story from 2013). She also hopes to work more with Moby, whose songs ‘Like A Motherless Child’ and ‘Mere Anarchy’ she just remixed for an EP called ‘Adoption,’ one of her few new releases in 2018. After mixing last year’s ‘Mood 50’ compilation herself, she handed the reins of the label’s latest comp, ‘Best Of Mood 2018’, to Ruetz, a German DJ/producer with a flair for infectious yet minimal grooves. “A very, very talented boy we are pushing at the moment,” Moudaber says with motherly affection. Mood Records seems to have a special affinity for artists who, like Moudaber, are transplants. Fur Coat’s Sergio Muñoz and Israel Sunshine, for example, are Venezuelans based in Barcelona; Sudo brothers Isao and Takashi hail from Japan but operate out of Berlin. Moudaber says this isn’t by design, but simply reflects the increasingly borderless nature of dance music itself. Want more? Read our UK cover feature with Nicole here.